The first book in its trilogy, "The Worlds of Ambré" is a fantasy romance about Leela's introduction to a fantastical world she never knew existed. Leela is brought into this world by the enchanting Eli, who informs her she belongs to an ancient species called Tuatha. Written in first-person with affecting narration and engaging dialogue, the authors pull the reader into this magical story. The book has elements of fantasy and romance, bringing the reader a rich literary experience. There are a number of twists and turns throughout the plot, which really sets up book 2. Overall, a great introduction to what is looking to be a very, very promising series. I highly recommend this book for fantasy readers who want a fresh read with a beautiful love story. Finally something brilliantly written, super funny, adventurous and passionate. 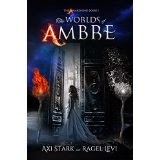 ‘The worlds of Ambre’ is such a fun to read I couldn't put it down before I finish it. I wish I have the same powers as Eli does , play with the fire or could move as fast as he does. Or at least had the black Lamborghini that he drives. I just love Leela. The language used to describe the love scenes Between Eli and Leela is so amazing and is written in such manner, that makes you experience everything like you were there. And let me tell you….. Its WooooooW!! The book is written from first person, so basically you see everything that she sees, you feel what she feels, and you have the powers to control the water like she does. In the beginning of the story I had the feeling everything moves slowly but after a few pages I understood how wrong I was. This is one unforgettable book full of adventures, and most importantly fills you up with such a joy and happiness, that you forget where you are, who you are, uplift your soul, and brings you to places that you've always wanted to go and experience. Yes, yes! I totally agree what the trill to read!! Thank you for recommending this book! I cannot wait for the second part to come! please let me know when it comes out!